I met Tuesday morning with a group of pastors, as usual. Our reading came from the Moravian Daily Text. It was Luke 6:39-40. At first glance, this seems like a collection of disparate teachings. The leader of our group suggested that this was a rabbinical style “string of pearls” teaching technique (apparently the rabbis wouldn’t teach for too long on one subject but would move from one to another to keep the people engaged). Nonetheless, I saw a similar idea in most if not all of the teachings. I saw several other ideas as well, which I recorded in my journal. The big thing I heard here is that most teachings have behind them the idea of a “good” or “fully trained” man. This in turn lead to the question, “Am I good/fully trained?” For me, this is a difficult question, one I’ve struggled with all my life. I “feel” and/or believe the answer to be, “No.” For that reason, I felt very challenged by these teachings. I felt eliminated by them, in fact, as if they disqualify me or reveal my disqualification from the community of Christ. As I continued to contemplate these things, I realized there is actually invitation here. I think it comes when Jesus says “The student is above his teacher”. With that, Jesus is eliminating all need for competition and comparison. He is telling me that there is only so far I can go in this goodness/training, that I’m certainly not going to go further than or supersede Him (the teacher in question). That being the case, I am free to pursue goodness and training without needing to wonder how much I and/or how much more I am than anybody else. I took this to be an encouragement. I saw, then, that Jesus was not eliminating me here (establishing that I am not good/fully trained) but encouraging me (asking me to pursue goodness/training). One of the pastors in the group further suggested that this is not something we can do on our own, that goodness comes into us only from God. I think this is suggested by the “foundation” idea Jesus ends the message on. That foundation is obviously God/the teachings of God. The man builds on it, puts some effort into setting himself upon it. But that effort is only effective because God is there to begin with. The main idea I took from this reading, then, is that God is an encourager, encouraging me to growth/training in His Kingdom. The subsequent action I took from this reading was a need to ask God to make me good, to remove the evil stirred up in my heart/the plank in my eye/my blindness so that I can be good and fully trained as He is encouraging me to be. And that’s what I saw in Luke 6:39-49. Ok, just one more response to a comment on a Timothy Keller tweet. I found this one while I was looking into the others and, much though I hated to do it, knew I had to write about it. The commenter here is suggesting that God could have created a world without evil and thus without suffering. He further suggests that God didn’t do this because of “reasons”. By this, he is suggesting that that God either didn’t have reasons to create the world the way He did or (more likely) no reason for God’s creating the world the way it is has been given. I suspect it is the latter, but I don’t know for sure. In either case, the assertion is that neither God nor His followers have/have given reasons for the evil/suffering that currently exists. Not only so, but that assertion is made in a sarcastic and disrespectful manner (the “because whatever” formula usually implies some intellectual deficiency in creators of whatever is being critiqued). I literally rubbernecked when I saw this book on an endcap display at the store. I was walking past it, saw it out of the corner of my eye, and was one step beyond it when I realized what I had read and had to jerk myself backward for a second look. 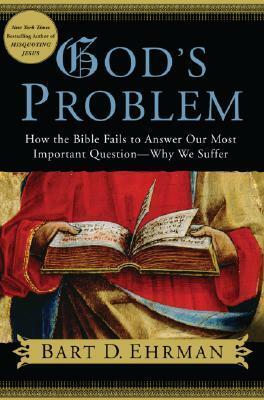 The Bible, Ehrman suggests, fails to answer the question of why we suffer, a question he considers “the most important”. I was surprised to hear the Supreme Being in the Dawn of the Croods show my daughter has been binging lately give this same answer to this same question in the episode “Themy Might Be Sky Giants”. So I’ve seen this suggestion before, sometimes seriously, other times as flippantly as the commenter here. And there are quite a few elements of this suggestion that I have trouble with. Some of them are ones I’ve already covered (this is fairly close to the self-defeating “I don’t believe in God because I don’t like Him” argument; it also doesn’t offer any solution or end to the problem it is critiquing, as it seems to think it does). A new element, though, is veracity. What the commenter is suggesting here and what Ehrman is directly stating in the subtitle of his book and what both Time Bandits and Dawn of the Croods are having fun with is just not true or accurate. The suggestion that no reason has been given for the evil/suffering that currently exists is patently false. The fact of the matter is several good (that is, complete and comprehensive) reasons for the evil/suffering that currently exists have been given. We have to go no further than the third chapter of the first book of the Bible to find the first reason. Genesis 3 tells us in no uncertain terms that evil and suffering exist because of us, because of our actions. God gave us a paradise, a place without evil and suffering. He created the world the commenter wanted created. And we messed up. To me, this is a sufficient reason for the existence of evil. It is well-known, too. It even has its own Wikipedia page. That being the case, I just can’t understand how people miss it. Free will is obviously another. I’m not sure there is a biblical reference for this one, but it seems quite logical to me. Having freewill creatures (the only creatures worth entering into relationship with) brings the risk of evil. Even Bruce Almighty understood this. I don’t know why so many people today don’t. (I could only find this in another language, but Bruce is asking how to make somebody love you when they have free will, and God, if I remember correctly, says that is the big question). Third, and I think perhaps the greatest, is the fact that there are reasons we can’t understand. The book of Job (a very early book; some think the earliest of all the biblical books) teaches this. Job spends the bulk of the book wishing God would tell him why he is suffering. When God finally appears to Job, He does not do that (even though it would have been so easy to do; He could have just said, “Me and the devil had a bet, Job. Good news: you won!”). Instead, He just tells Job about all the wonderful things He has made. I believe His point there is that if Job couldn’t understand physical things like snow and donkeys and ostriches, he wasn’t going to understand a complex spiritual thing like evil and suffering. The real interesting thing about that encounter is that Job accepted it. He believed God gave him all the answer He needed (and if he believed that, who are we to contradict him?). So the suggestion that there are no reasons for evil/suffering is a false suggestion. It is not true. What we really have here is a refusal to accept the reasons for evil/suffering. That is what I suspect is really going on here. I don’t know for sure; I can’t read minds and so don’t know why the commenter or Ehrman or any others make this accusation. But it seems to be a possibility. If there are reasons and you know there are reason and you still say there are no reasons, then the problem isn’t in the reasons. The problem is in you. The problem is you don’t want to accept the reasons. And if that’s the case, well, fine. You are free to reject these reasons if you so choose. Just be sure to be honest about that. Don’t depict this as something it isn’t (i.e., there are no reasons). Depict it as what it is (i.e., you just don’t like the reasons).